World equity markets are down slightly this morning as Spain officially entered a recession, although the GDP report was better than expected. Merger Monday is back, with a deal in the energy space (Sunoco) and the healthcare space (Gen-Probe). Bonds and MBS are up small. Personal income came in at +.4%, and personal consumption came in at +.3%. The Personal Consumption Expenditure (PCE) indices indicate inflation is well under control. The National Association of Purchasing Managers – Milwaukee showed business conditions are improving slightly overall for companies in the Northern Midwest. No, they didn’t just do a reverse split. Barnes and Noble has doubled this morning on a strategic deal with Microsoft. The new company (NewCo – clever name) will involve the digital and College businesses of B&N and involve a Nook application for Windows 8. This looks like the culmination of B&N’s strategic alternative review announced earlier this year. Tomorrow (May 1) is New Year’s Eve for the Left. Expect disruptions in the City and overseas. No M.R. tomorrow as I will be traveling. Wed and Thurs MRs will be late. There are very few things that shock me but when my husband came home Friday from the lockout of our tenant by the sheriff’s department he began preparing me for the shock I was about to experience. 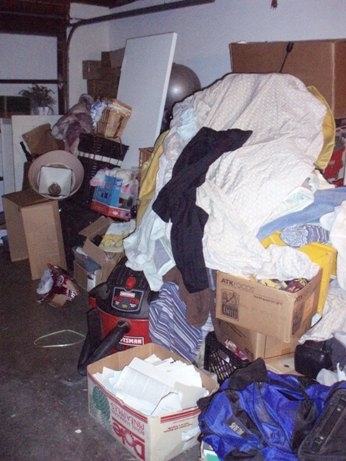 Some of you may remember we’ve been involved in an eviction process on our rental property (the bulk of our retirement income) since January and even hired some legally challenged lawyers to represent us in the misadventure. I call it a misadventure because it feels like a miracle to us that we finally got our home back. The lockout would have occurred a month earlier but the city recently decided that our street was one of the ones that needed a new street sign. A problem arose when the sheriffs attempted to post the final eviction notice about six weeks ago and the spelling on the street sign didn’t match the spelling on our legal documents. The city had changed an “e” to an “o” and so we had to wait two weeks for a new sign and another two weeks for the city workers to install it. Cha-ching, another $1600 down the drain. Of course our lawyers thought it would have been better to change all the paperwork to the incorrect spelling………………………idiots. Anyway, my husband met the officer and the locksmith at the house Friday morning and originally told our tenant she could have 1/2 hour to vacate. 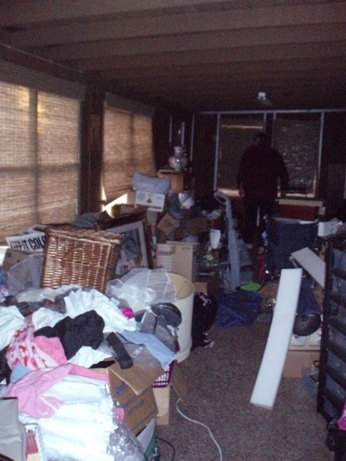 The sheriff informed him that we had to store whatever was left at the house for 15 days, either at the house or a storage facility, charging her reasonable rates, and then could either sell it or trash it. Then my husband went inside. Needless to say, when she said her boyfriend was on the way with a big truck to move some stuff, he gave her the rest of the day to vacate. 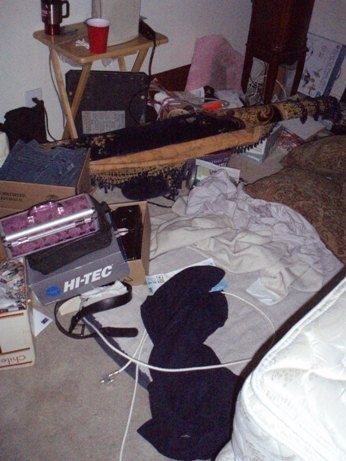 Every room, save one, looks exactly like the pictures below, and that one room is pristine…………………….bizarre. 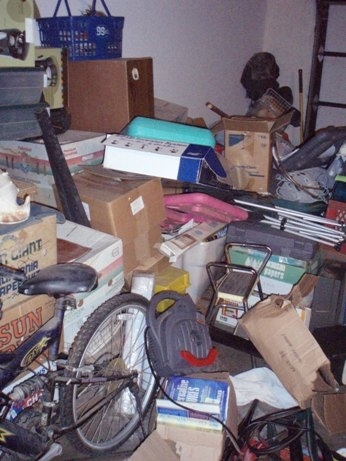 All of this was left after two big truckloads had already carted away some of her belongings. So now our house is a storage facility for another 12 days and we’re hoping they’re coming back for more although they already cancelled the appointment to meet my husband over there today. 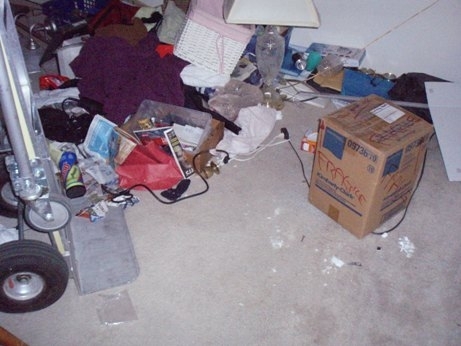 I feel sorry for anyone who is for some reason compelled to live like this, but right now I feel more sorry for us, because we’re going to be stuck with the cleanup………………………………….yuck. A Financial Times article posits that we are undertaxing the rich. Another reason advanced for not raising taxes on the highest incomes is that it would not make much of a difference. In fact, the income shares at the top are so high that this is no longer true. Thus, raising the average income tax rate on the top percentile to 43.5 per cent from the low level of 22.4 per cent in 2007 would raise revenue by 3 per cent of GDP, closing much of the structural fiscal deficit, while still leaving the after-tax income share of the top percentile more than twice as high as in 1970. However this assumes that capital gains are taxed at the same rate as wages, otherwise the income is just renamed and the effect of the higher rate is nullified. Markets are generally flat this morning after the release of Q1 GDP, which came in light. The economy expanded at a 2.2% annual rate in Q1 vs expectations of 2.5% and lower than the 3% number in Q4. This more or less confirms the slowdown we have been seeing in other data as well. Yesterday, initial jobless claims came in at 388k. Yesterday, the National Association of Realtors released their March Pending Home Sales Index, which is a forward-looking index of housing activity based on contract signings. The first quarter’s activity was the highest in five years. Supply and demand are becoming more balanced. It will be interesting to see whether the banks start letting more REO go to meet the increased demand of if they continue to drip out inventory gradually. Bill Gross continues to bet that Operation Twist continues as a mortgage play. Further, he believes that QEIII is a possibility, especially if the employment numbers weaken. Interestingly, he is also looking at this trade as a volatility bet – if you are long mortgages, you are short bond volatility – and is betting that the 10 year has more or less found its level for the next couple of years. A pet peeve of mine is this whole idea that the repeal of Glass-Steagall somehow caused the financial crisis. It turns out that Tim Geithner agrees with me that GS didn’t play a material role. No other country in the world (EU, Japan, UK, Canada) separates commercial and investment banking, or even draws a distinction between the two for that matter. Glass-Steagall was instituted because investment banks were stuffing their sister commercial banks with poorly underwritten bonds after the market crashed in 1929. If the investment bank couldn’t sell the paper to public at par (or close to it), they sold it to their captive banks who bought it at par and marked it there until bank runs exposed the fact that these bonds were worthless. The investment banks did the same thing with the insurance companies, which is why insurance companies were included. The point of G-S was to prevent this sort of thing and to ensure that these transactions would be arm’s length. The financial crisis didn’t occur because JP Morgan was selling suspect bonds to Chase at the end of a gun barrel. Or Citi selling worthless paper to Travelers for that matter. The cause of the financial crisis was a deflating real estate bubble, which hit banks with large derivatives exposure (Bank of America and Citi) as well as small community banks that were in the very ordinary business of making mortgages, car loans, and business loans. It turns out that the smaller banks are the ones who can’t repay TARP. If we didn’t have a real estate bubble, we wouldn’t be having this conversation.Why did we have a real estate bubble? There were a lot of contributing factors, but the biggest was the Fed and a psychological belief on the part of the public that real estate was a one-way bet. People forget the reason why we repealed Glass-Steagall in the first place. The main reason was that the big international investment banks like UBS and Deutsche Bank were able to undercut the US investment banks because they were able to borrow at zero, while Goldman and Merrill had to fund their balance sheets at LIBOR. “Wall Street” was turning into Nomura, Barclay’s, Credit Suisse, and ING. Second, there were a couple of commercial banks who had become hybrids – JP Morgan and Bankers Trust – with Citi and Bank of America close behind. Glass-Steagall was becoming irrelevant anyway and the repeal was more or less an acknowledgment what had already happened. Speaking of Joe Biden . . .
Bad Lip Reading did this . . . It seems to me what she’s talking about is, though, crowd-sourced infrastructure that dynamically accomplishes many of the goals of government (especially at the local level) with the easier distribution of information and the encouragement of involved citizenship. Sort of a bottom-up socialism. One that completely decentralizes the entire process of “getting things done” in the community.